The 4 Month Scarf or "Stashbusting, Fact or Fiction"
Inspiration: A pattern from Interweave Press - found the pattern! 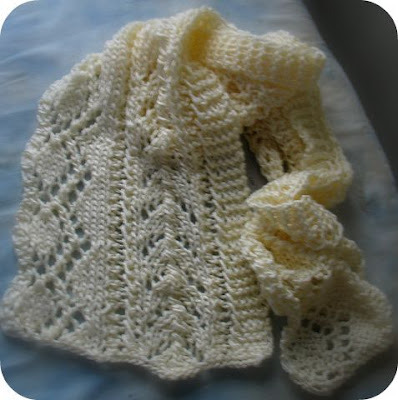 It's the Juliet Scarf by Louisa Harding from the Knitting Little Luxuries book. and if I can find it on my pc, I'll update it here asap. I think it was a limited-time download from an upcoming book. I started this back in August, thinking I could whip this scarf out within days.... I just finished it last week and it was a very belated birthday gift. The pattern was a 12-row repeat and right away I realized that I needed complete concentration to make this. It was no movie & knit project. If I lost track of where I was, I ended up taking it all out again and starting fresh - not something I enjoy much. So... I left it for those rare times when I had quiet and was awake enough to concentrate on the pattern. I wonder how people make a hobby of knitting lace. It wasn't very hard or complex - just not very relaxing for me. On a more positive note, the yarn was a bamboo mix - one skein that I got from A.C. Moore and it was sooo soft and nice. I'm definitely going to buy more of this, double up the strands and make another scarf in a less complicated pattern. Last week I pulled out every skein of yarn I own and tried to combine them into batches to work with in the next few weeks. I have some scarves planned, some fingerless mittens and wool bowls. It was overwhelming to see all those skeins piled up on my floor. I have lots of partial balls, some from finished projects and a lot that people give me because they know I like the challenge of an small bit of this or that. And then I dug up the wool I bought from a woman on Craig's List over the summer. And then found the alpaca that was spun by someone I met online. And realized that my claim to be trying to "stashbust" is hopeless. I don't buy excessive amounts of yarn, but who can resist a knit/crochet convention and a sale on Smooshy yarn? I know I'm not alone in this boat, I have a yarn stash, a fabric stash, a bead stash, a paper stash, an embellishment stash... and I think every other crafter who makes things does the same. As a matter of fact, I wonder if it's even possible to make things and NOT have a stash???? Thanks! It's my ironing board. Usually I take pictures on a white piece of paper in indirect sunlight - this one I was in a hurry for, so left it where it had been blocking. Since the blue cover looks nice, maybe I need to add more color to my pictures in the future! ?